Thank you for making Michigan a big part of your success. ...and thank you for allowing us to very publicly record (in detail; for history) what immediately occurs in terms of our myriad of political parties (grassroots included) every single day until you are inaugurated. If Michigan conservatives or "Tea Partiers", hand-in-hand with MiGOP leadership, immediately co-opt our new president's often self derided party affiliation for 'cover' using intentional celebratory inaction and focus) to justify a non-muddied Michigan Capital lawn during our ALREADY wholly corrupted lame duck? The stain of these obvious (in)actions over the next two months will only cement any Michigan political party's fate for generations to come. Winning a war doesn't necessarily mean winning your freedom (or more importantly your children's). This is especially true when those presently (or previously) in power are allowed to 'grovel' before the unwashed masses are allowed that same audience or voice of (conversely) reason. Michigan conservatives now have a choice. Either (finally) expose Michigan Republican politics for what it truly is (and always has been) when given the opportunity on a silver platter? Or simply remain (since well before '09) as the serfs/puppets of the same old party masters very easily demonstrating to President Trump that "absolutely everything in Republican Michigan politics is just dandy" AND "unified". If the 'conservatively unwashed' or those leading them are not very public, loud and and articulate beginning no later than when the sun rises today until the inauguration? The once-in-a lifetime opportunity **LOST** for our children will be far greater than even Trump's victory today or any hope that it may have afforded for those following behind us. No two months were ever more important in American grassroots political history. ".No two months were ever more important in American grassroots political history..."
...and no president has ever relied more on the truth being told to him (unfiltered) in the most expedient manner possible (as was the president's former reality in business). The further trampling of our voices is being strategized upon as we wake up today. The only unfiltered arena where those voices will ever be heard is our Capital lawn over the next two months. If you believe that Right To Work during this exact point in history 4 years ago was simply 'bad' and that no significant history ever occurred there? You are not only ignoring the cost of freedom but encouraging others to do the same to save your own hide NOW (period). If the well manicured grass of our Capital lawn remains undisturbed until spring? Our only unfiltered method of actually PROVING any love or legacy for the next generation will whither and die with those blades as well. This was the most fun political season EVER! A perfect storm needed to DRAIN THE SWAMP! If you think you can lay back and rest--think again--our work is just beginning. The evil forces out there are regrouping as they have the most to loose. We too must regroup. Our first priority is BuckOfama care. Trump keeps saying "repeal and replace". There should be no replace--no government subsidies--repeal it and lets get on with personal responsibility. The next thing is strengthen the military--with BuckOfama care gone, the money will flow again. The Millennials will need retraining to learn those life skills on how to live without a helping hand and to learn that the only hands they have to help themselves is at the ends of their arms. Lastly, study the history lessons we all went through and I'm humbly proud to be part of it. Lesson 1: HillBill(y) and BuckOfama are narcissists. It is an extreme psychiatric anomaly for which there is no cure other than to RUN! The main factor of narcissism, once you recognize the condition, makes the game plan very easy. Whatever they are accusing you of they are actually doing. The Leek of emails proves this point. The arrogance involved in narcissism eventually implodes them. OMG that's going to be really fun to watch. Lesson 2: What we experienced in mainstream media can only be fixed by us--the not-so-silent majority. The media can only enjoy 1st Amendment speech if it's the truth. Very little of truth was put out by this corporate crowd. You have the power to fix it with your pocket book--do so. Put these creeps outta business by expressing your displeasure to their advertisers--newspapers, TV, etc. Lesson 3: There needs to be lots of prosecutions--that's how the system works. You break the law, you harm people you need to go to prison. As for the HillBilly(s) their punishment is exile to Haiti to live in the housing and factories they failed to build and talk about wealth redistribution--we can start immediately with the Clinton Foundation. The empire has fallen, the oligarchy crushed. Thank you God for watching over us. Thank you, God for bringing us the president desperately needed to instantly refocus our attentions on the fact that all politics are indeed local. Please bless us us with the courage to recognize this fact both in our immediate discussions every day afterwards and soon on the cold muddy lawn of our Capital across from those who oppose us. When I was driving around the Michiania-area this morning trying to find out what happened, all I could get was the NPR stations (WBBM wasn't in range for some reason). The unusually dour & downbeat air staff was becoming even more-so when Trump's numbers were creeping closer and closer to 270 and Podesta had just left the meeting with his closest advisers Zaphod Beeblebrox, ALF & Mr. Spock before telling HiLIARy supporters to comeback in the morning (this was before her concession phone call just before 3). Things picked up when the NPR people interviewed a bunch of malcontents supporting HiLIARy (i.e. militant LGBTIQ, black militants & members of the Danny Ortega fan club) and who were blaming her loss on those no good uneducated xenophobic white racists (a common description from everyone they interviewed), and the best part was when several of them began to cry on the air. But what really ticked me off, Ms. Schwartz, was when I got back to Detroit and was listening to Beckman on WJR.asking EVERY republican that he could get on the air (from Lil' Ronna to Mike Bishop) about previous republican party "promises" to get rid of Obamacare once they got into office. I wasn't very convinced by their sincerity on following through. The prosecutions will be another interesting angle. Pres. Trump was being very magnanimous (probably from pulling a 36+ hour day) during his acceptance speech when he was complementing HiLIARy. but one of the radio people brought up Trump's comment from the debate about it not being a good thing that he was President because she would be in jail. None of the spokespeople from either party would address that. I'd love to see HiLIARy spend the rest of her life in Leavenworth. I just don't think that Team "r" has the backbone to follow through with it. 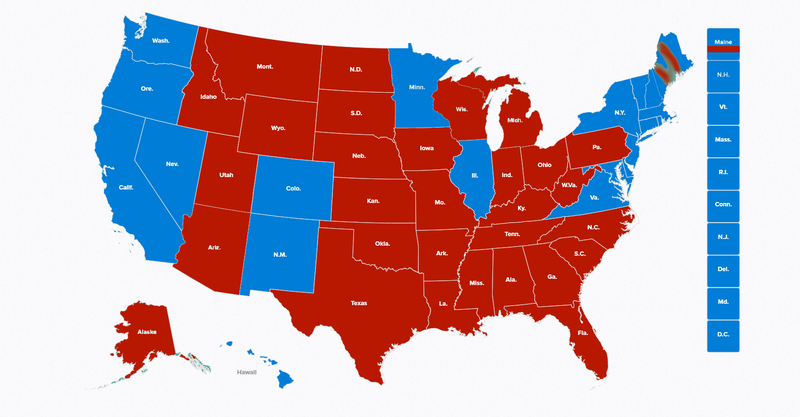 A landslide of electoral college votes. Can Life get better????? '"...A landslide of electoral college votes. Can Life get better?????..." Not one single person reading the above so much as 'disputes' this with thousands rioting in the streets all over this country in the immediate aftermath? Unless confronting those seeking to overthrow your country in the streets, universities or on our Capital lawn is your absolute favorite "let's roll up our sleeves now and get to work" thing to do...how does the above possibly resonate with ANYBODY given no plan **whatsoever** to either counter **or immediately proceed** with any known plan of action??? Establishment Republicans LOVE any oft repeated call to action obviously ignored by all those who witness it. Nasty posters calling people names over simple opinions held and shared?...even better. A poster who will 'take' whatever is thrown their way and come back for more?...paradise. You cannot effectively gauge apathy (or the control gained through just plain generational selfishness) without that same instrument being applied to the truth being told at any given moment in time *publicly*. Every call for action (often angrily) ignored combined with every insistence that 'Xanadu' is indeed already here? Assures those already exhibiting what physically happens to "unapproved" protestors (exactly 4 years ago on our cold, muddied Capital lawn during Right To Work) as those same two very well supported 'grassroots' political parties very happily join forces to "keep the peace" in Lansing or anywhere in Michigan (unprecedented security force present or not). Life will get "better" when the first patriot steps out of his or her house and applies the exact same **TIMING IS EVERYTHING** strategy being applied RIGHT NOW directly outside their very windows. What are parents and grandparents telling their youths full of hope in their eyes or their full grown children when they are asked why they cannot go out to play today or why all 'public' conservative-based grassroots activity effectively waned (even more) with the rise of Trump? That 'patriots' indeed learned the lesson of 2012 when our brothers and sisters were cut down on the lawn of our Capital without an (similar) even peaceful counter effort whatsoever offered up in the immediate aftermath? Timing is everything and my generation is but well versed in the 'musical chair' timing of filling their own pockets while even their own are told to (meekly) starve at the tree of liberty.